Ferrari just unleashed a teaser trailer of their most powerful car ever, the F620 GT, but the company is already hinting at an even more powerful, more exotic prancing horse. 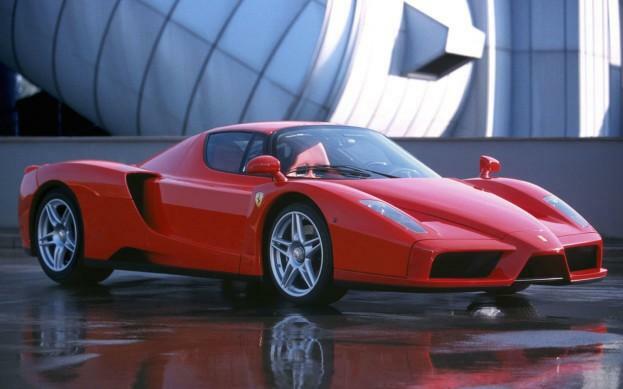 The long awaited replacement for the Enzo (pictured), nicknamed the F70, is coming, and it will be a hybrid. Ferrari CEO Amedeo Felisa told Automobile that the F70 will be powered by a gasoline engine combined by an electric motor. Most of the power will come from the same 7.3-liter V12 that will debut in the F620 GT. That gargantuan engine will produce 800 hp, while the electric motor will add 120, for a grand total of 920 hp. The electric motor will get its juice from a KERS (Kinetic Energy Recovery System) package, derived from Ferrari’s Formula One racers. This system stores energy, recovered during braking, in a spinning flywheel and releases it as the car accelerates. Ferrari claims the electric motor can power the car by itself for some zero emission driving, but with only 120 of the car’s 920 horses available, it seems those zero emission sprints will be short if the F70 is driven with any vigor. The KERS package adds some weight, but probably not as much as a battery pack. Regardless of the weight of its powertrain, the F70 will be incredibly light. According to Automobile, Ferrari is trying to hit the weight target it set with the 2007 Millechili concept: 1,000 kilograms, or 2,200 pounds. That would not only make the F70 lighter than the Enzo, but also the extreme FXX, which wasn’t even street legal. Such low weight would also give the F70 a slightly better power-to-weight ratio than the Bugatti Veyron, meaning it could potentially beat the Veyron in acceleration; top speed would be another story. The instantly-available torque from the F70’s electric will certainly help it off the line. The F70 will be an amazing car when it finally leaves the factory, but it will have plenty of competition for the title of supercar of tomorrow. Porsche is taking orders for the 918 Spider, a mid-engined hybrid roadster that promises a top speed of 200 mph and 94 mpg. Acura’s Superbowl ad star, the NSX, is also headed to production with a hybrid powertrain. All Ferrari’s are special, but the company only builds a no-holds-barred, mid-engine supercar once every ten years: the ‘80s had the F40, the ‘90s had the F50, and the ‘00s had the Enzo. Each was faster and more technically sophisticated than the last, so it’s fitting that the F70 will embrace hybrid technology to help the breed adapt to the 2010’s.